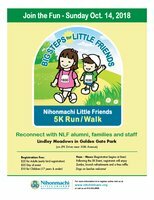 San Francisco, CA - Nihonmachi Little Friends (NLF) will hold its fifth “Big Steps for Little Friends 5K Run/Walk” on Sunday, October 14, 2018, at Lindley Meadows in Golden Gate Park. Proceeds from this fundraising event will benefit the children’s programs of NLF and their outdoor gardens and rooftop playground. Registration for the event can be accessed through NLF’s website at www.nlfchildcare.org. On the day of the Event, the 5K run will start at 9:00am with check-in beginning at 8:00am in Lindley Meadows. Walkers will start at 9:30am, with check-in beginning at 8:30am in Lindley Meadows and will conclude by 11:00am. Following the run and walk, participants can enjoy breakfast/brunch refreshments, meet up with old and new friends, or participant in some Zumba, all in Lindley Meadows. Each participant will be entered into a drawing for an iPad Mini. Contributions to NLF can be made on-line through NLF’s website, or mailed directly to NLF at 1830 Sutter Street, S.F., 94115. Donations are tax-deductible to the extent allowed by law. For more information, contact NLF at (415) 922-8898 or via email, nlfchildcare@gmail.com. mkambayashi . Última actualización Sep 18 2018 2:04 p.m.